Got a great idea for a project or an event, but not sure how best to raise the money required? Keeping your eye on the end goal, whilst running a fun and engaging fundraising campaign can be very challenging. 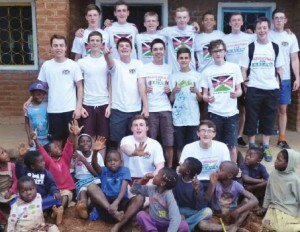 Dunblane’s BB Company, 25th Stirling, in partnership with ‘Classrooms for Malawi’ spent a couple of weeks this summer to renovate two school classrooms. Thanks to fundraising efforts, led by BB leader Colin Anderson, they raised an unbelievable £70,000 for the project! Although most Companies can rely on the odd coffee morning or bag packing stint to get them the funds they need to cover their annual costs, with a little bit of creative thinking, you could unleash a new income stream and also build a better team and reputation at the same time. When brainstorming fundraising ideas, it’s normally best to get a cross section of your Company to help. That includes leaders, young people and parents. The more ideas that get shoved into the melting pot the better. When thinking about ideas, try to think how they can be twisted to make them unique and fun. Daft ideas will be most memorable but you do have to make a judgement as to whether they are pragmatic or not. To keep things structured a bit, have a think about things you can sell, services you could offer or events you can put on. First think about the skills that you have available from your volunteers. Will they have the ability and time to make as many things as you need to sell? Have a think about the profit margin too. If the cost of the materials is high compared to the price you can sell them for, then consider if it is worth all the effort. Also think about how you are going to market your goods. Are they for your specific area or can you market them nationally? You have to constantly think about the buyer and what they will pay for them. Don’t fall into the optimistic trap and maybe try selling samples before you grow the supply. One of the boys in the team had the idea that he was going to have bricks of Lego in his house and he would sell bricks to his friends and family who could write their name on the brick and help build a Lego school. This idea was supersized into a Lego school that was 100cm by 50cm long. The Lego school was at all the events and it grew more attention as it got bigger and bigger. Local businesses were asked to put in windows in exchange for advertising and the school also went around the schools and churches in the community helping with publicity. 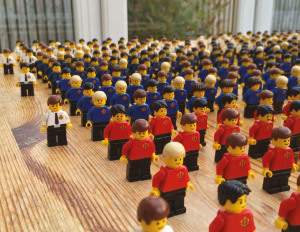 An offshoot of this idea was to create Lego people with BB uniforms on. Prototypes were created and an initial batch was sold to the Company in Dunblane, they went like hotcakes. They were then advertised on the BB Scotland Facebook page and demand went through the roof. There were even large orders from Hong Kong, Singapore and China. Getting the young people involved is normally key here. You have to think about what your Company can offer as a service and whether it is sustainable. Also think about putting a twist on it so that it stands out as unique. Car washes are all well and good, but why not try a fancy dress car wash? Who wouldn’t want their car washed by Super Mario or Spider Man? Special twists like these add an element to your fundraising that makes it publicity friendly and newspapers love that. Try and think of ideas that may cause a trend or a certain amount of curiosity: something that makes people do a double-take. 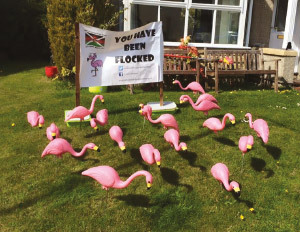 Although a common fundraiser in the United States, flocking someone’s garden with pink flamingos and then demanding a ransom for them to leave is not a common occurrence in the UK. The flamingos did have to be sourced and brought over from the US and Canada, but they created a huge impression in Dunblane. People would stop their cars to take photos of the flock wherever they turned up and it opened a revenue stream for the project that would have not been opened before. The buzz around the town was great and social media and the newspapers loved the idea. The flocks continued to reinvent themselves too with Birthday and Christmas flocks available (including little Santa hats). Although they were auctioned off at the end of the project, they still receive requests to appear in gardens. The main thing you have to think about when putting on a fun event is whether enough people will come to cover your costs and make a profit. So you have to think about whether your event is a ticketed event and then think about the up-selling element once you have your crowd. Do you have a stall or a tuck shop/drinks table? Think about what else your audience would be willing to purchase to have fun – extra bingo tickets and a bingo night or a tombola. Have a think about your audience too. Is it a family friendly event like a beetle drive or bingo night? Or is it a more adult evening like a wine, gin or whisky tasting? Get a good compere and if it is a game night like bingo or beetle, then add a twist and make it fun. The Beetle Drive event was an opportunity to involve young people from all sections in a fun evening. Most of the audience didn’t know how to play so there was a need for a careful explanation of the rules. Tables were placed in a circle and the winner of each table moved clockwise around the hall whilst the lowest placed of that game moved anti-clockwise. This ensured that the event was a great mingling social experience. The twists – the winner had to wear a hat that had a huge beetle pinned to the front and wear their Beetle Crown. We also had prize rounds where the winners of each table came up to the front and had to answer a beetle (or Beatle) related question right in order to win a prize. There was also a tuck shop, a tombola and our Lego School available.